At Black and White Construction we build each structure with superior products and quality without the need to increase the price to our competitors’ levels. Thoughtfulness, competitive buying, and care of product selection it’s what separates us from our competitors, this has helped our team keep cost down and pass those savings on to our customers. Consistently, our bids have always been lower than our competition. We work with each customer making them part of our team, developing ideas and solutions that surpass all expectations. The company continues to provide exceptional workmanship, products, service, and value every day to our customers. We pride ourselves on the integrity of our work, ability to build stable relationships and our capabilities to save customers time and money. Black and White was founded in 2006 by two builders with over 30 years of experience and was initially geared towards buying land and building its projects. Although successful and very profitable, one of the owners realized that many of the homes being built near Black and Whites’ were often of marginal quality and overpriced. Greg Simmons then decided he wanted to move the company towards a more service-oriented direction. He had the desire to build a better home that would cost less and give customers instant equity upon completion. It was a bold move and one he would be taking on his own. The company was reorganized with full ownership resting with Greg in 2008. Greg has been building residential and commercial buildings since 1986. He has built in California, New Mexico, and most recently in Houston Texas. He has completed over 500 structures ranging from low cost, first-time ownership homes to multi-million dollar dream homes, light commercial buildings to larger commercial projects and he enjoys remodels and additions. 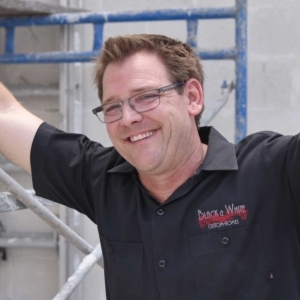 Building homes is a passion of Greg’s, and he likes to be hands-on, working side by side with his qualified and professional in-house crews. At Black and White Construction we build each structure with superior products and quality without the need to increase the price to our competitors’ levels. Bawcon © 2018 All Rights Reserved.